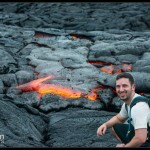 During my visit to the lava flow on Hawaiis Big Island I took more photos than I care to admit. While it was still bright enough I was able to take a number of photos that captured the beautiful motion of the water as it gobbled up the lava, sucked it up, and continued and added it to the growing list of ingredients for the soup known as Island Making. 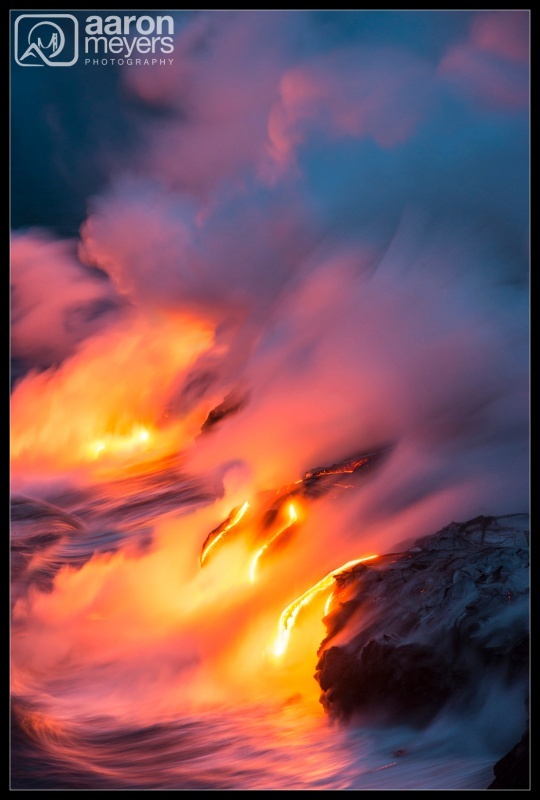 As I watched the lava enter the ocean I was amazed at how much of the water continued to glow even after the lava had entered the water and cooled off. This also created a huge amount of toxic steam. Not only was the steam bad to breath but it also covered the composition I was trying to photograph. Most of the photos I took this evening were covered completely in steam. I patiently waited for some of the steam to subside and for the 3 or 4 lava streams to be visible. Using a 0.8 second shutter allowed me to capture the motion of the incoming wave.